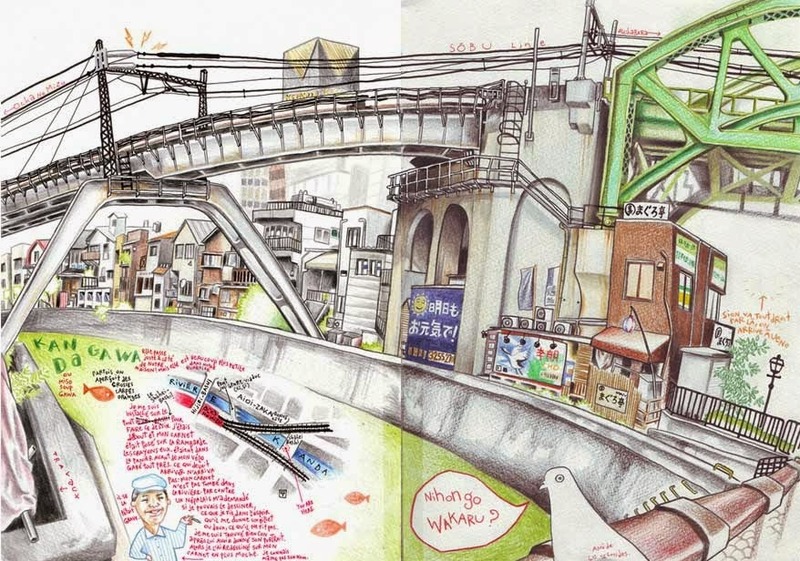 Over the course of six months, while his girlfriend interned in a company in Tokyo, young graphic artist Florent Chavouet wandered the streets with a pouch full of coloured pencils and a sketchpad visiting many of its most well known and even some lesser known neighbourhoods sketching scened of everyday life in the city. This 208 page book is filled cover to cover with beautiful hand drawn pictures from his journeys. 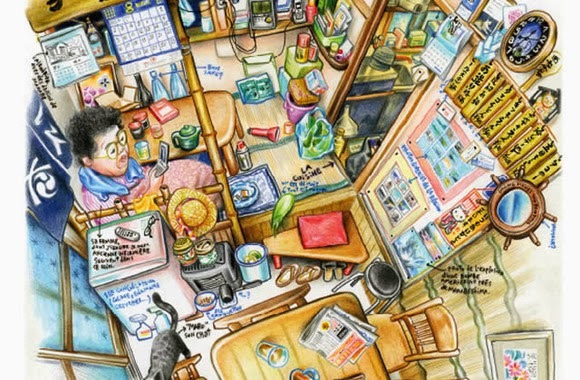 The artist captures more than street scenes and architecture paying particular attention to smaller details such as posters, packaging and what many of us living in Japan consider to be most uninteresting everyday objects which when looked at through the eyes of a visitor are fascinating parts of Japanese life. 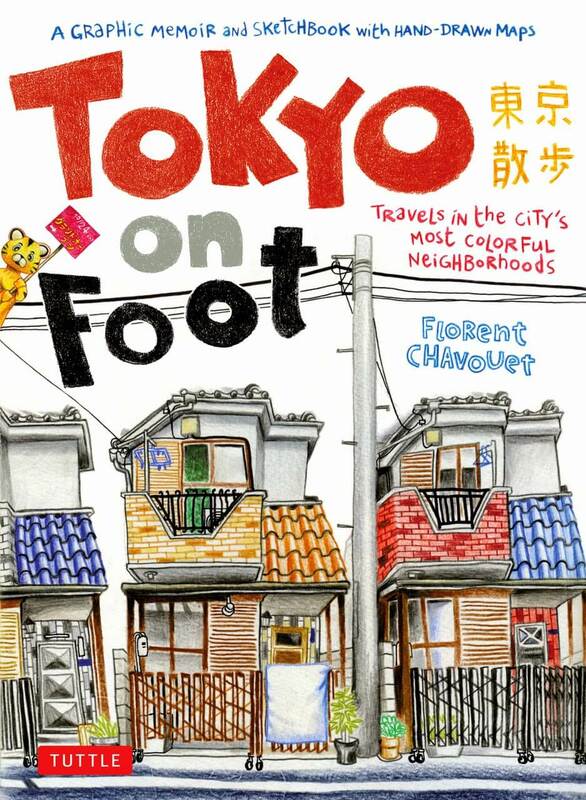 Chavouet is also a wonderful people watcher, his sketches capture the various fashions of each district in the city, from elegantly dressed ladies in Ginza to the street styles of Shibuya and Shimokitazawa. His drawings of people are filled with movement and actions, these people were actually doing things hen sketched which he captures in the smallest of details. Handwritten comments often accompany pictures letting you know just what was going on in the scene at the time, or why a particular sticker on a lamp post caught the artists attention. I love that in each area he visits the artist has paid particular attention to the Koban, or police boxes that can be found all over the city as he showed me something I've not noticed in almost 20 years of living here. He showed me that the architecture of police boxes varies greatly around the city. You'd think these essential public facilities would all adhere to a particular style to cut costs but the truth is there are an amazing number of different styles of Koban. In addition to this more than one page is dedicated to capturing the antics of the local constabulary, including random bicycle registration checks. 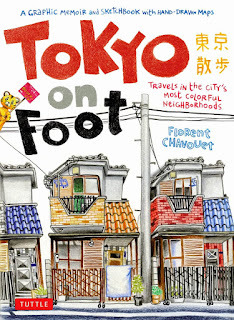 Taxis, politicians, laundromats, train stations, garbage bins, vending machines, parks, bicycles, people, stamps, power lines, point cards, cafes, advertising, absolutely anything you can imagine about Tokyo is captured in this book. The artists attention to detail is truly amazing and he even treats us to a detailed look at his bicycle. 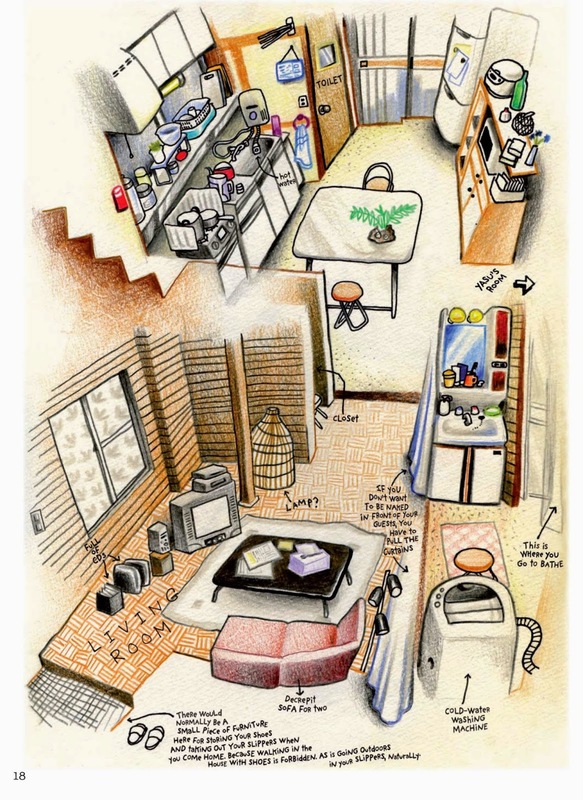 Detailed hand drawn maps abound, and the fact that they re slightly dated drives home the point that Tokyo is an city that is undergoing continual change. When this book arrived my daughters studied the most minute details of every single page from cover to cover, unable to put it down for hours. Over the course of a month I would flip through the book revisiting scenes I'd viewed before always finding something I overlooked on the last viewing, the details are truly amazing. If you love Tokyo as I do then I'd highly recommend Tokyo on Foot.